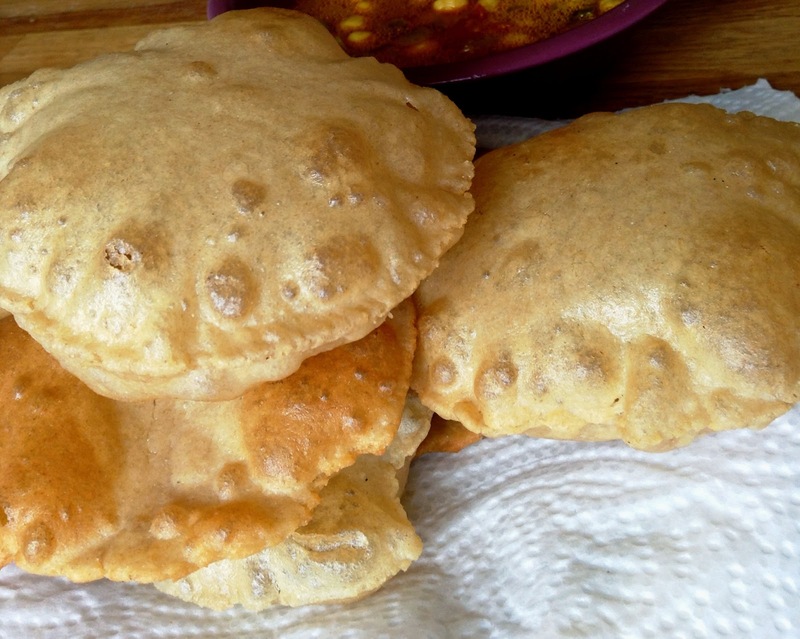 The hot, round, fried puffed poori.. who doesn't love it.. Every household have it's own variation of dishes to be consumed with poori. While growing up, we used to have a heavy breakfast of aaloo-poori (Aaloo recipe); and a lot of times we would eat poori- chhole (Chhole recipe: soon). When I moved out of India, I continued the same. So these are the only two dishes I make poori with; but of course it can be experimented with a wide variety of dishes. And of course, a yoghurt dish HAS TO BE there; be it the plain Boondi Raita, Garlic Raita or Spinach Raita. A lot of friends of mine, and a lot of people I know have a hard time in puffing up the pooris perfectly. I learnt to make the pooris from my nani ji, right from the dough to frying; so here I'm sharing the tips from nani; hope it helps some people. Mix the oil in the flour and also the salt if using (I do not prefer to add salt). Mix well with your hands to bring it to a crumbling consistency. Now very slowly add water to the flour to make a hard dough. Keep aside for 10 minutes. Now pinch very little balls from the dough and keep little oil on the side in a bowl. This oil will be used in place of the dusting flour we usually use for the regular chappatis. Take one ball, roll and shape it in your palms. Now add little oil to both sides of the ball; just remember you will NOT add any more oil while flattening it. Now with the help of a rolling pin, roll it slowly to a little poori, it will be less than half the size of roti. TIP: Roll it just on one side, don't roll from both sides as we do the roti. This is the reason pooris don't puff up while frying. Repeat for all the dough and keep on a dry and clean plate. Heat the oil on high heat and add one poori. We use a slottled/ spider spoon for deep frying. Another tip here for frying: As soon as you add the poori to the oil, it will begin sizzling. Very lightly press with the spider spoon to all the poori before turning; it will already puff by then. Turn and fry completely. Drain on a kitchen paper. Repeat for all the pooris. Serve hot. you're welcome.. great to hear that pooris came out good..